Craig William Heyward was born September 26, 1966 in Passaic. He was larger-than-life as a boy, both in terms of size and demeanor. He was double the weight of most of his friends, which led to teasing and fights. He acquired the nickname “Ironhead” around the age of six thanks to his fighting style. He would ram opponents in the chest with his head. By the age of 10, Ironhead weighed nearly 200 pounds. He was literally too much for his family to handle, and they shipped him off to the Skillman Training School—what used to be called a reform school. There he developed into a first-rate athlete, and after enrolling at Passaic High School, he became a basketball and football star. Ironhead stood 5' 11" and weighed 250 pounds, yet he could still dunk. On the football team, he played running back and linebacker, and also handled punting and placekicking duty. The day before his 16th birthday, he ran for 247 yards in a game. Ironhead was honored as an All-American his senior year, and finished his career with the Indians with 5,142 yards. That was enough to convince the Pitt Panthers to offer him a scholarship. After red-shirting the 1985 season, Ironhead made the starting lineup and amassed more than 1,000 all-purpose yards. His junior season was one for the books. He topped 100 yards in every game to tie an NCAA record, was a First-Team All-American and finished fifth in the Heisman Trophy voting. Pitt went 8–3 and was invited to its first bowl game in five years. Ironhead decided to skip his senior year and go pro, having rushed for more than 3,000 yards as a collegian. 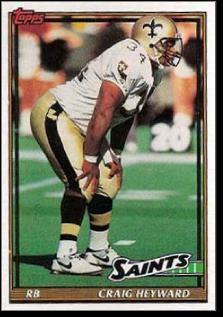 The New Orleans Saints selected him with the 24th pick in the 1988 NFL Draft. Ironhead played fullback beside Dalton Hilliard and Rueben Mayes. He proved to be a devastating blocker and competent receiver, and was no fun to tackle when he carried the football. He showed surprising quickness for a man his size. Unfortunately, his size became more and more of an issue. New Orleans is not a good place for people who like to eat, and Ironhead inhaled all of the rich delicacies the city had to offer. His weight ballooned to 330 pounds—a good 100 pounds over his ideal playing weight—and the team released him after the 1992 campaign. The Bears picked Ironhead up in 1993, but he could not control his weight and they showed him the door. Ironhead had literally eaten his way out of football. In 1994, the Atlanta Falcons offered to give Ironhead one last shot—if he agreed to learn better eating habits. He spent several weeks in the Duke weight management program and by the start of the season his weight was down to 265. Over the next two years, Ironhead was one of the best runners in the game. He gained 779 yards in 1994 and 1,083 in 1995. The Falcons went 9–7 and made the playoffs as a Wild Card in ’95, and Ironhead was named to the Pro Bowl. Ironhead played three more seasons—for the Falcons, Rams and Colts—and finished his pro career with 4,301 rushing yards and a total of 34 touchdowns. Midway through the 1998 season, he complained of vision problems. Doctors discovered bone cancer at the base of his skull, which was putting pressure on the optic nerve. The cancer was removed during a 12-hour operation and Ironhead lived cancer-free for the next six years. Unfortunately, the cancer returned in 2005 and he passed away at age 39 in the spring of 2006. The Heyward name lives on in legend, as well as in the achievements of Ironhead’s sons. Corey became a basketball star playing point guard for georgia Tech, Craig Jr. played college football for Middle Tennessee State, and Cameron was a first-round draft pick in 2011 out of Ohio State and plays defensive end for the Steelers. Look closely at Cameron’s face the next time you watch Pittsburgh play and you will see the IRON and HEAD scratched into his eye black.